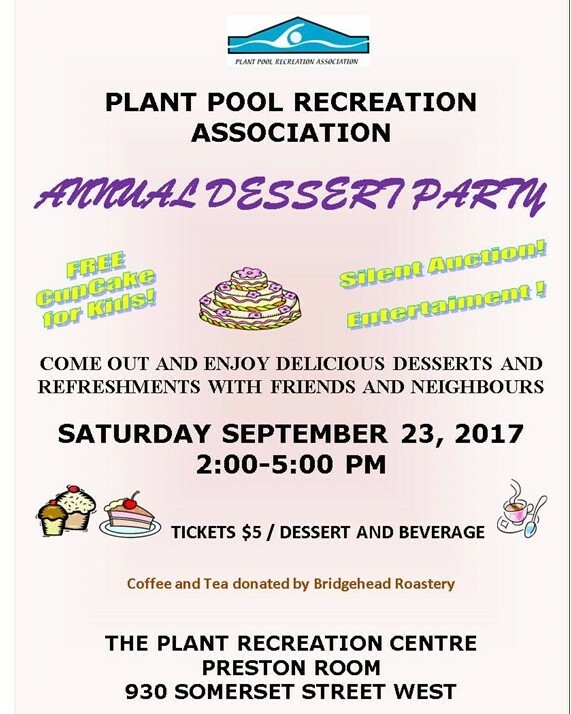 The PPRA’s annual Dessert Party is our original annual fundraising event. This event was originally held at St. Luke’s Church when the Plant Pool was closed for several years. It was an important event back then to rally people to get involved in saving the Plant Pool. The Dessert Party continues to be one of our favorite events (CAKE ANYONE?) and an important fundraiser for the summer park program and our other initiatives throughout the year. We love this event! It is fun for us and your whole family. It is great chance to get to know your community and meet up with old friends. Most of the Dessert are homemade and there are always healthy options for those on a low fat, no sugar or gluten free diet. The coffee is always graciously provided by our local coffee shop Bridgehead, there is tea available and a spiced green tea made from scratch is usually on tap. Free cupcakes for kids, a silent auction and most recently we have been provided with live orchestral music by members of the Parkdale Orchestra … ALL FOR $5 it is a great deal!